Nano Mushroom Pillow Buddies are here! They are the cutest, adorable and newest kids in the block. Your kids, big and small will love bringing them everywhere for company - while watching tv, during trips and in bed! Any of these pillow friends can provide companionship and comfort and security for your kids. 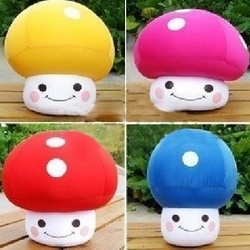 For an added form design, the Mushroom Pillow Buddies ccome in a variety of vital and intense colors - bright red, bright blue, bright yellow and bright pink. Extremely popular, especially for girls and children, they are perfect gifts to give!